T.S. Stribling was an odd duck, and it is doubtful that he would have objected to this characterization. He was a remarkably down-to-earth fellow for one who at one time was a best-selling writer, generally favored by critics, and winner of the Pulitzer Prize. Tom Stribling outlived his fame, outlived his success with editors and critics but seems to have accepted that with amazing good grace. He enjoyed good health into his 80s, was blessed with a happy marriage, and continued to enjoy writing long after hopes for eventual publication faded to nothing. Perhaps the most unusual aspect of Stribling’s life is how he accepted each twist of fortune with the same good humor. His ego did not swell to impossible size with the Pulitzer, nor was it battered to nothing when his novels stopped selling. 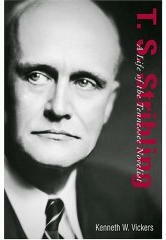 There are many reasons to recommend Kenneth W. Vickers’ T. S. Stribling, a Life of the Tennessee Novelist, but not the least of them is the pleasure in making the acquaintance of the wonderfully quirky Tom Stribling. Aside from his own very interesting literary career, Stribling traveled widely and became acquainted with (among others) mystery writers Harry Stephen Keeler and J.S. Fletcher, friendships that Vickers documents. Stribling has three separate reputations as a writer, with all three being admittedly minor. The primary reputation is as a Southern realist (or precursor to a generation of realists) who won the Pulitzer Prize for 1932 with The Store, the second novel in a trilogy. Despite his flaws as a writer, Stribling’s novels remain readable, and for students of southern fiction well worth rediscovery. The second reputation was as a writer of odd stories to Adventure, arguably the leading pulp magazine of the first three decades of the 20th century. After years of making a living writing uplifting stories for the Sunday School magazines, Stribling graduated to Adventure just after the end of World War I. Editor Arthur Sullivant Hoffman published south sea stories, westerns, lost race yarns, and historical adventures from any era. The magazine had a distinct personality, with the letter column “The Campfire” serving as a meeting ground for readers and writers. At times it seemed as if most of the writers and many of the readers were living lives as exciting as any that appeared in the fiction. Factual accuracy was prized above all and readers would quickly attack a writer for relatively minor errors. Given that background it is a bit surprising that Hoffman would publish one odd story after another by Stribling. Hoffman eventually created a special heading “Off theTrail” for Stribling’s stories. Some of the stories were science fiction, such as “The Green Splotches” (January 1920) and the very odd “Christ in Chicago” (8 April 1926). This latter story depicts a totalitarian future where the medical profession seeks to perfect a master race by eliminating through euthanasia the handicapped and those considered defective. Into this society a faith healer by the name of Immanuel Hevesh emerges, offering hope to the poor and threatening the ruling elite. Even with Hoffman’s evident affection for Stribling, he must have gulped at all the taboos that were shattered in this one story. Other Stribling stories were mysteries, and there began the third reputation: as the creator of Henry Poggioli, Ph.D of Ohio State University. In the early stories he was said to be an instructor in psychology, and a professor of criminology in the later ones. His academic background remained in the background, however, as the professor became one of the strangest detectives ever created. The first five Poggioli stories were all published in Adventure, and all were based in the Caribbean, culminating in one of the great surprise endings of all time with “A Passage To Benares” (Adventure, Feb. 20, 1926). With this, the series seemed to have reached a natural end, and the five stories were collected into Clues of the Caribbees (Doubleday 1929), which Ellery Queen later selected as one of the most important volumes in the history of the mystery short story. A third series of Poggioli stories began in Ellery Queen’s Mystery Magazine in 1945. Frederic Dannay, one half of Ellery Queen, included a Poggioli reprint in the first issue of his magazine. Naming himself the ‘Number One’ Poggioli fan, Dannay convinced Stribling to begin a new series, and those stories over the next decade became the last new fiction to be published by Stribling. In the 1950s a few of the Poggioli stories found their way into the Robert Lowndes-edited pulps Famous Detective and Smashing Detective and the final stories were published in Saint Detective Magazine. A selection of these final stories was published in Best Dr. Poggioli Detective Stories (Dover, 1975). The original Poggioli stories were intended as a send-up of Sherlock Holmes. Stribling is quoted as saying he made his hero something of a fool almost as a relief for readers so used to brilliant detectives. With colorful professor moving through the picturesque Caribbean, the pace is so active that many readers may not have noticed that not much is detected quickly enough to have an impact. When he returned for the last time to the character, the professor had a bit more success and the comedy was provided by his constantly skeptical writer companion, who narrated many of the stories in First Person. Although some are slight pieces hindered by poor plotting, others are quite entertaining, and a new story in the series generally rated mention on the magazine covers. Vickers often quotes the correspondence between Dannay and Stribling and the affection between the two is evident. Stribling must have tried the patience of Dannay at times, especially when the Tennessee writer wrote a story commissioned by Dannay and then first tried to sell it to the Saturday Evening Post, which often published Stribling’s mainstream stories. Thankfully, for EQ readers the SEP editors turned the story down. Vickers made good use of the extensive Stribling papers in Clifton, Tennessee, and at his alma mater, the University of North Alabama. One wonders if any correspondence between Stribling and Robert Lowndes, Leo Margulies, and Hans Stefan Santesson, the other later-day Poggioli editors, survives. A few of the Stribling stories feature African-American characters that are racial stereotypes. This includes both several of the mid-period Poggioli stories as well as several of his well-paid “slick” stories for the Saturday Evening Post. As a southerner of a certain age, I recognize that such stereotypes existed in real life, but that does not make them any less uncomfortable for me to read, for I now understand the awful system that forced people into such positions for survival. But I do not automatically condemn a writer in the early decades of the twentieth century. It helps if there are other counterbalancing stories or characters in the writer’s body of work. In Stribling’s case, he wrote a powerful anti-lynching story “Judge Lynch” for Adventure, June 1934. His southern trilogy, and especially the Pulitzer winning The Store, dealt openly with one of the south’s most common aspects that was also the most condemned – miscegenation. In telling his story in the trilogy, Stribling revealed the hidden subtext of the interracial relationships between characters. Certain black characters were sons or daughters of the central white characters. Everyone knew this but no one ever, ever openly acknowledged it. Certain of the white characters were in love with and had long-term relationships with black characters, but while this was recognized by everyone in the community, it was never, ever publicly recognized. I think this was one of the reasons that the influential Agrarians group of souther poets and writers, including Allen Tate and Andrew Nelson Lytle, so bitterly attacked Stribling (while he was highly praised by Theodore Dreiser, among others). Yes, they were probably jealous of Stribling's commercial success but they were also, surprising for such a revered group, often little more than southern apologists and Stribling was attacking at a most sensitive point. But Vickers provides yet another pointed affirmation of Stribling’s racial viewpoint. In the late 1920s, Stribling became a business partner with African-American George E. Haynes, and together they owned apartment buildings in New York. As the Depression deepened and hard times impacted rentals, it would have been easy for Stribling to turn on his partner. Instead, Stribling went out of his way to be supportive, at one point borrowing money himself to give to Haynes. This is a fine biography and I recommend it to anyone with any interest in southern fiction, pulp fiction, or the life of a fine southern gentleman, Tom Stribling, who traveled widely, made many friends, and had a full, noteworthy life. Footnote. 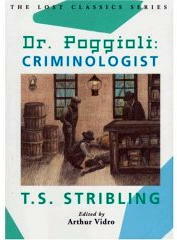 The book referred to earlier in the review has now been published: Dr. Pogglioli: Criminologist, by T. S. Stribling (Crippen & Landru, hardcover & trade paperback, September 2004). This review previously appeared in Mystery*File 44, June 2004. Copyright © 2004 by Steve Lewis. All rights reserved to contributors.